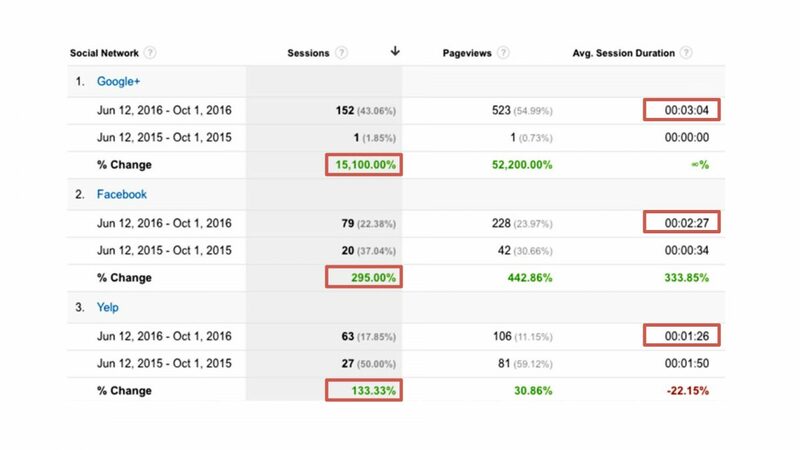 How one local business boosted organic SEO, website traffic, and reached more customers with Google+. Many businesses and even SEO experts have been skeptical about the relationship between Google+ activity and its effect on local SEO. Their skepticism has been rightly justified up until now. However, thanks to our close relationship with widely recognized SEO and Local Business expert, Mike Blumenthal, it is now a strong indicator that Google+ can have a significant impact on local rank. A solid Google+ marketing strategy can significantly boost organic search reach, website traffic, and drive more business. The following case study is one of many where our efforts on behalf of a client have driven clear business results. Within the first three weeks of starting work on Barbara’s account, we saw significant gains in organic reach. 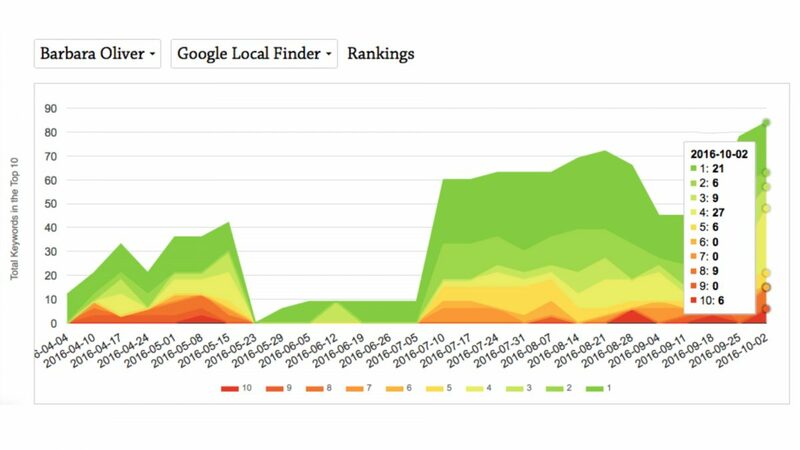 The above chart shows the Google Organic results over time. As shown in the chart, our work began at the beginning of June 2016. 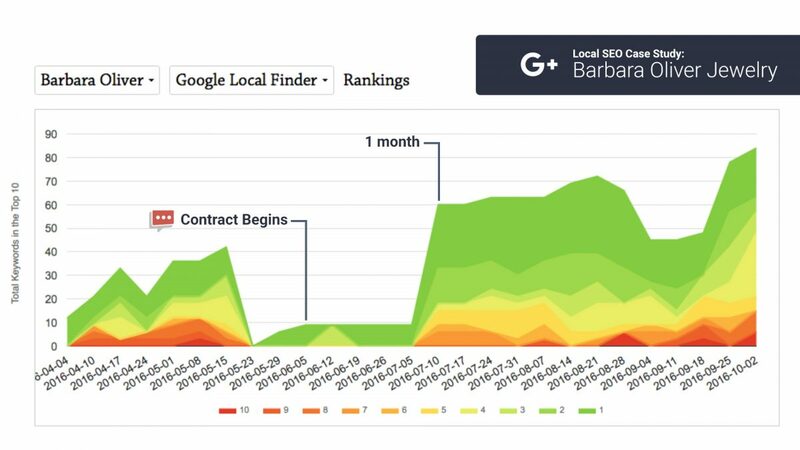 By June 26, 2016 (just 3 weeks) we had seen significant gains in the number of organic keywords getting top 10 search results. 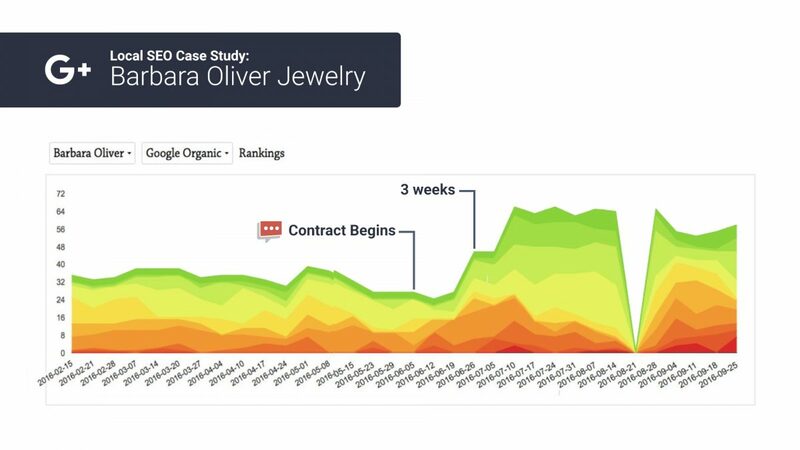 Within just a few more weeks of that, we saw an additional spike in organic keywords getting top 10 search results. Unfortunately, a misstep on behalf of the website developer caused us to lose out on 4 days worth of tracking. However, once the tracking was reinstalled, trends continued to hold. Even after leveling out, we continued to see gains in lower ranking terms. When Google Possum hit, many sites were dramatically affected by seeing a decrease in organic search. Our client only saw minimal impact from this view, as you can see. We also were able to bring the trend back in the upward direction within a couple weeks. However, our team was quickly brought back onto the account and immediately began seeing a return of the lost gains. Below are a few more charts documenting the organic growth over the course of our testing. So what’s the secret that our team has figured out? Mike Blumenthal explains it best. 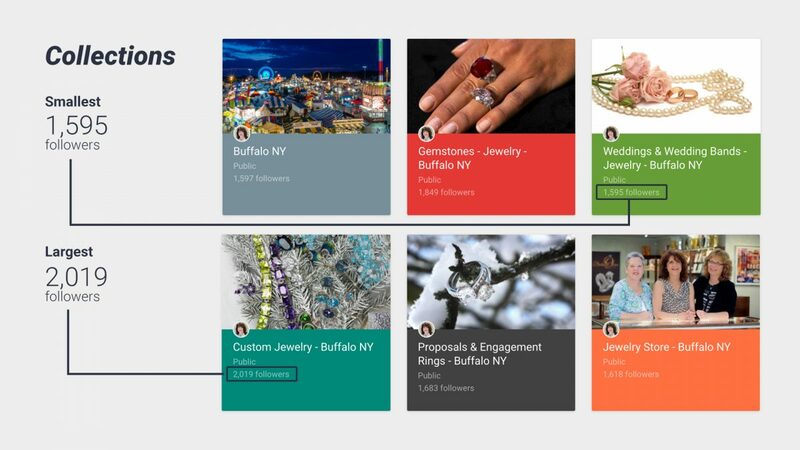 Google+ connects the relationship between the social page and the website and then partners that with the relationship of the social followers of the page to the website. This carries a high level of semantic relevance and, therefore, authority. The content aligns with the data from the website, and also confirms facts across the web. Google is seeking facts that can align with the intent of a user’s search. By writing content, sorting it into an interest and then having that data validated by users we are able to “teach” Google more about the entity. When a social action is taken on Google+, this sends a +1 or “Social Signal” that helps strengthen the entity. Knowing this, our team emphasizes high-quality content creation that is sorted into relevant, semantically optimized Collections. This means they simply can’t verify all the entities involved in the social activity in order to make a data-driven ranking analysis. But with Google+, they do have access to all of this data. Google+ doesn’t have the billion+ users that Facebook has. But it does have enough active users in enough topic areas worldwide to make it a valuable network for business. 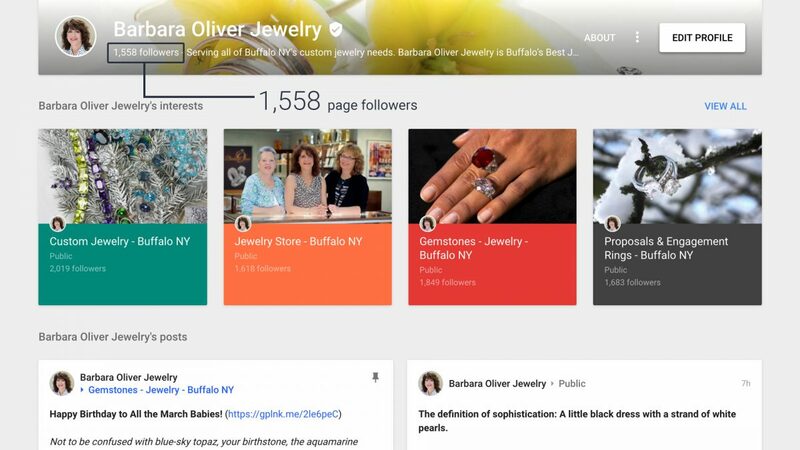 Barbara Oliver Jewelry went from 180 followers to over 1,500 followers. And these aren’t just random, useless followers. These are followers with a high degree of engagement because they have been specifically targeted by our team. All of the engagement (+1s, comments, shares) seems to aggregate authority that transfers to the profile that then transfers the authority back to the local entity and it’s associated website. Over the course of our testing period, the client saw a dramatic increase in Google+ traffic. This Google+ traffic also had a longer average time on site. We also saw a 9% increase in (localized) Sessions and 113% in Avg. Session Duration. A 20% increase in Driving Directions was also something that the client really appreciated. Who doesn’t want more people getting directions to their brick and mortar business? Needless to say, both our client and our partner Mike Blumenthal were very happy with the results. Our study shows conclusively that a properly executed Google+ strategy can boost organic local SEO rankings and drive real business results. Let’s get your business moving in this same direction, contact us today.